A Spectacle of Glory by Joni Eareckson Tada is a 365 Day devotional book, its short lessons packed with wisdom from God’s Word. It’s so easy for me to feel sorry for myself day by day, but reading devotions written by Joni, who at a young age became paralyzed from a tragic accident, her strength and devotion to making her life a spectacle of glory for God is truly humbling. “You’re about to meet three women named Mary, each of whom has a life-changing encounter with Jesus. Mary of Bethany prepares the way for the Lord’s burial when she anoints His feet and fills the air with her perfume. His mother, Mary of Nazareth, remains by His side from His first breath to His last, her loyalty unwavering. Mary Magdalene, delivered of seven demons, bravely supports her Teacher through His darkest hours, then proclaims the glorious news of His resurrection. 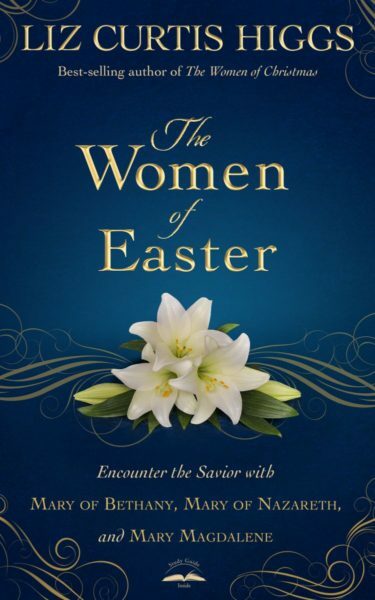 Your mind and emotions will be engaged and your faith strengthened as each scene unfolds, preparing your heart for a richer, deeper Easter experience.” -The Women of Easter synopsis. I personally love anything written by Liz Curtis Higgs. Her writing is so emotionally charged and full of imaginative detail, which brings people of the past to life. I loved her descriptions of each woman at the death of Jesus, giving us small glimpses of what it might have been like at the foot of the cross. A wonderful read for the Resurrection season.